To really get innovation we need to look at electric batteries in cars as distributed sources of energy for the grid that just happen to be on four wheels. The two energy crises in the 1970s spurred the United States to start the Department of Energy, and in turn, to pour billions of dollars into R&D to prevent another crisis from happening. But much of the progress we have made since then is in the electricity sector, not the transportation sector–the true source of the crises. The reason for this is that infrastructure entrepreneurs don’t feel like they have a good chance of seeing a return on their hard work. For some anecdotal evidence, I just searched on the site Entrepreneur.com for “automobile entrepreneurs.” Of course, I discovered a story on Tesla from 2007. There is also a slideshow of brand name companies “servicing” the auto industry that took off with the “insight” of entrepreneurs. We see iconic names like Dent Doctor, Meineke, Midas, and more. 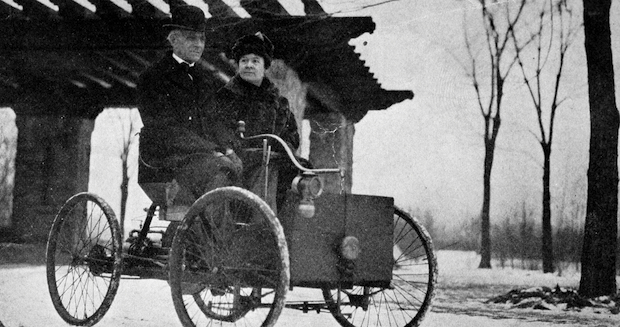 Unfortunately, when we think of automobiles and entrepreneurs, the last real game changer was back in 1903. The name: Henry Ford. With oil prices back up over $100 a barrel, entrepreneurs and government are working on transportation again. This time around, we have seen some progress on second generation renewable fuels, natural gas, efficiency measures, and other opportunities. Mostly, we’ve seen innovation in electric cars. Just for the sake of argument, I want to explore this global clamoring for electric cars. And in this area it seems that we must think not about cars, but electric batteries. The beauty of the electric vehicle is not the technology, but the business model innovation. I have counted 17 revenue streams you could charge for with an electric battery in addition to the expected car payment. In California, the peak demand for electricity is roughly 60,000 megawatts. Imagine that there are just 250,000 electric cars out of a total of 30 million registered vehicles. At 20 kilowatts a piece, these electric cars can provide about 5,000 MW of instantaneous power or one-twelfth of the entire grid of storage. Using 10% of all cars, you could back up the entire grid for a short period of time and support high levels of renewable energy penetration. So 30 years after the oil crisis, how do we actually facilitate the switch to non-oil-based vehicles en masse? We need to look at electric batteries in cars as distributed sources of energy for the grid that just happen to be on four wheels. Instead of buying a car, people could buy a vehicle services contract. The auto industry could work like the solar electricity companies. Customers could pay on a cost per mile basis only for what they use–at a price cheaper than gasoline, just like many of the power purchase agreements in the solar industry. While the consumer has the car parked a minimum of 95% of its lifetime, the car battery can be used to create additional revenue from the electric utility that more than pays for the “premium” price for an electric vehicle. This creates a two-way street for autos and the grid, or V2G–“vehicle to grid”–technology. A pilot project at the University of Delaware, headed by Willett Kempton, has demonstrated that these V2G services have a value of over $5 a day per vehicle. Utility and government regulators alike love the concept because these batteries can be far cheaper than building new power plants or new transmission and distribution lines. Business model innovation, such as in the case above, could remove the roadblocks for transportation entrepreneurs to enter the scene. It could create an infinitely scalable industry with compelling financial returns. Doing well by doing good–that’s what I call a true impact investment.